Wow, the weeks are just flying by of late. (Super busy at work with a new product release in a week). Day 1. Cross training day with Benson in the Opto gym. Good solid workout. Struggled through the first half, but really put some effort in on the second and really bought the pain. Great session. Tracked it with the watch. Have not had time to go back and enter all the weights. I really wanted to do a new test I found in my watch, but had left the heart rate strap at home and so could not do it, for some reason this really got me down, so I set off a bit despondent. Both Bob and Benson were busy or out on travel, so it was a solo run. First half of the run I had a good talking to myself and decided to do some sprints, so put in on the usual two segments. The first was nothing to talk about, the second was much better. I beat my own time and missed the first place by two seconds….. its nice to have a challenge. Day 3. 4 miles. Lactate Threshold test. Bought my heart rate strap in and the other guys were busy, so rather than doing the trail as usual, I did the Old Town loop and did the new test I found on the watch. Lactate threshold is the exercise intensity at which lactate (lactic acid) starts to accumulate in the bloodstream. In running, it is the estimated level of effort or pace. When a runner exceeds the threshold, fatigue starts to increase at an accelerating rate. For experienced runners, the threshold occurs at approximately 90% of their maximum heart rate and between 10k and half-marathon race pace. For average runners, the lactate threshold often occurs well below 90% of maximum heart rate. Knowing your lactate threshold can help you determine how hard to train or when to push yourself during a race. In short, it is the sustainable heart rate and pace test. Turns out, it is a very hard test for an inexperienced runner to do…. I have never had to run to a fairly precise 10bpm window before. My first test was a bit of a mess, my second test in the second part of the run was much better. I tried the test again when running with Bob and it failed, so it really is something you need to do on your own. Bottom line, the watch continues to impress me and the data is helpful and customized for me. Standard Old Town circuit run with Bob. Day 5. 6 miles. Solo Hill climb. Was felling pretty good, so headed out to the hill at the back of old town. For the longest time, I was the top of the leader board for this hill climb, but late last year, some 35 year old came out from nowhere and knocked me off by a good many seconds… So yeah, I went to see what I could do. Eh. There will be another time, it is all fun and games. Day 6. Rest day. Went to LA for church and had a very social day with after church lunch and then out to dinner with some church folks at a very noisy restaurant. Exhausting stuff. Woke up at 10 past 3am. Wide awake, so figured I may as well go run. Was out the door by 4:02am Nice steady pace. A little quick, spent a few miles trying to pull myself back and was mostly successful. Had some gear trouble (my shorts kept falling down). But otherwise, everything went perfect. I upped the size of the ear piece of the wireless ear buds and did not have to adjust them once the whole 2 hours. A record. Very happy. Was a bit slower overall than the last time I ran this distance almost 3 years ago, so a bit disappointed as I feel better this time than last. (Not that I clearly remember then). I think next weeks program is exactly the same, but with with curve ball of extra work at work getting ready to ship everything to Florida for the trade show the week after next and its training week, so yeah, a fair bit of pressure. (Might have to run in the mornings and work double lunches (I usual teach at lunch, then run, but don’t see me having the time this week). Starting to try and not freak out too much about running in Orlando the week after next. Bob said he would keep me on track, so will lean on him for support. The guy has run all over the world…. Orlando is child’s play for him. Day 1. Benson was busy and I was tired, so I skipped the weights and went to the pool. I have been wanting to add swimming into my routine for a little while, mostly because it is still really good cardio, but without the jolts of running…. I was right on both accounts. But wow, did it ever show up how unfit I really am. 12 minutes of actual swimming and I was had it. 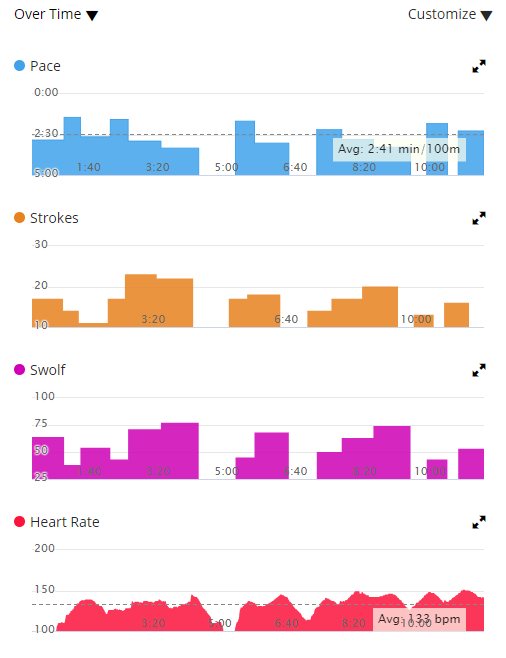 I am not as comfortable reading the swimming data, but it shows that my heart rate was going up over the whole exercise, so that was good (and bad). We will visit it again. Sometime. Days 2-5. 3m, 6m, 3m and 6m. Standard week. Standard runs. Did the trail on Wednesday and tacked some on the end. Was pretty tired at the end of it. Did not eat enough before I ran and hit hunger flat a few miles in. Day 7. 8 miles. Really smooth run. Very enjoyable. Only thing of note is that my wireless earbud fell out as I was adjusting it and it was a bit tricky to find. Hard to say why, but I have a little pain behind the knee on my left leg Monday morning. Could be my IT band playing up, or it could have something to do with the fact that I spent about 5 hours going up and down a ladder Sunday replacing the garage door opener. Will keep an eye on it and am grateful that Monday is a cross training day. Wow, the past week went quick. Day 1. Cross training. This time Benson and I actually worked out. I used my watch to track a ‘weights’ session thinking it would do little more than track my heart rate…. it just keeps on surprising me, in a good way. 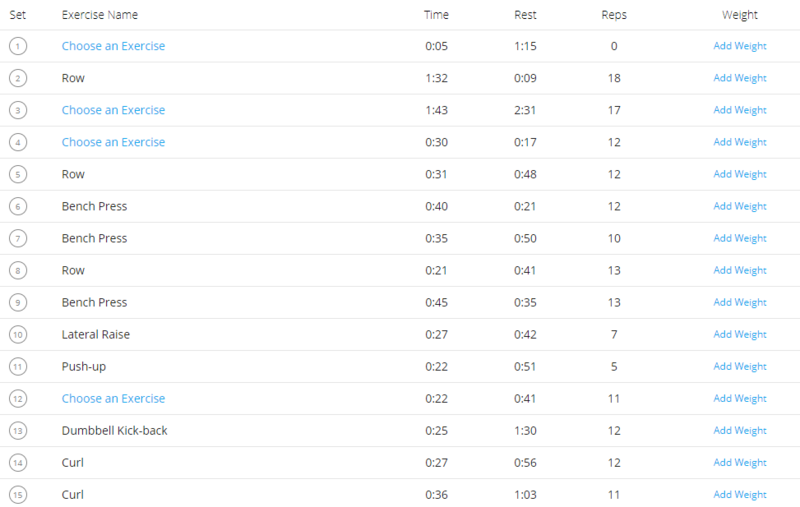 This is just a snip of the whole workout. The amazing thing is that it got most (~80%) of the exercise types and rep counts correct. I have not had time to put the weights in for each exersize and see what it adds to the data, but its on my to-do list. Anyway, its more of an upper body workout and I really enjoy it, so its nice to get it back into the routine. Day 2. 3 miles. First run with the Garmin chest strap. It not only gives me more accurate heart rate readings, but it also has an accelerometer in it. This gives more data points and refines some of the current points the watch already gives. One of the new data sets is vertical bounce. This is the amount of vertical bob my upper body makes each step. The more bob, the more energy I am expending needlessly, it takes a lot of energy to move the mass of my torso up and down. This is a trade off with my stride length, and stride length is an energy calculation as well. Anyway, point is, thanks to the chest strap linked to the watch and collecting all the data, I can measure any changes I make to my gait. Day 3. 5 miles. Wednesday is trail run day. There is a nice 3 mile loop near Opto and we just love it. Since I had to do 5, I just tacked a little on at the end, but the trail is a lot more work than road running. Prof is in the vertial graph. The trail is more of a whole body workout. One of the many reasons I like it, the other is, less cars / people. I intend to include it at least once a week for the whole program. I hope to get faster over the course of the training, we shall see. Decide to mix in some speed work on this shorter run. HIIT. High Intensity Interval Training. Its a thing. You basically do sprints over the course of the run. Again, Garmin watch to the adding interest. It links in with my Strava account, so I can save any segments to it, since it has GPS, it knows when I get close to the start of the segment and counts me in, then while I am running the segment, it gives me a time of how far behind or in front I am of the fastest person to run that segment. I mostly run against myself, so it also gives me my last time and so I can easily run against me. Lots of fun. You can see the clear bumps in the pace for the two sprints. I need to work in more of these sprints, so at the moment the plan is to do them on the shorter run day. Crazy busy day at work. Hard to focus, just a run. Day 6. Rest. We usually go for a 2ish mile walk with Freddy before breakfast. In the evening we had a Skype sesh with Gary and Dan. Always good to catch up, even when there are 24 minute delays in getting started due to computer issues at a place that is full of computers…..
Freddy had the idea to go out to Dripping Springs. Its a small state park not far from Temecula. Freddy hiked up while I ran up and back. We walked back to the car together. Its nice because its a pretty gentle uphill the whole way…. that and its a 8 mile long uphill. So yeah, a little longer than the training plan required, but I figured on walking back with Freddy as a walk, not a run. For the most part the plan worked. Just two wrinkles in the plan. 1. My right sock would not stay on. It kept creeping down my foot. Very frustrating. At one point, I stopped and swapped socks, and sure enough, the right one creeped down. Clearly there is something different about the shape of my right foot. (The socks were worn out and had zero eleactic in them, tossed them when I got home). 2. I just failed to get into a rhythm. Whether it was because I did not eat right the day before, or sleep well that night, dunno, but I was just all sorts of discombobulated. We plan to go back and tackle it again a few more times and get myself dialed in. Week 1 of marathon training is done. Day 1. Cross training did not happen. We intended to do the usual Monday free weights circuit in the gym (with Benson), but we have a big press release coming up on the 12th of February and are going pretty hard to get ready for it, we ended up working late rather than working out. Day 2. 3 miles. Also happened to be the first day of training here at Opto, so we just went latter in the day. Very straight forward, just cut a bit off the usual 4 mile run through Old Town Temecula. Day 3. 5 miles. Ended up doing this one solo. Trance, very straight forward. Through Old Town with a 1/2 mile out and back tacked on the middle. We have done this run many times in the past. Day 4. 3 Miles. Solo again. Added some speed work into it. The plan said to do the speed work tomorrow, but with training after the run, I had to hurry it up anyways. Day 5. 5 miles. Solo. Shirtless in the middle of winter! Nice trance mix. Very enjoyable run. Day 6. Rest. Gary’s favorite day. Went for a 2 mile walk with Freddy before breakfast it was such a beautiful day. Day 7. Long run. 10 miles. Freddy got me some Gu gel to have (100 calories and a bit of carbs). Ended up having to take two belts, one for the water and Gu and one with my phone, worked out pretty good, but want to get it worked out better. Had a great run. Had forgotten how much I love the long runs. Loved the watch as soon as the sun came up and I could see it. Still getting it dialed in. There are a lot of options, but there is no question, I love the data. Here is just a small taste.